The Pavtube DVD to HTC Converter for Mac helps HTC Androids players to put their DVD collections to HTC Evo 4G, HTC Incredible, HTC Hero, HTC Legend, HTC Touch Pro and more HTC smart phones. This guide is written to help Mac guys that wanna put their DVD to HTC Droid (X) for play back. It focuses on downloading DVD to Mac, converting DVD movie episodes to HTC Droid optimized videos, and synchronizing converted shows to HTC Droid. Step 1: Import DVD movie to the Mac DVD movie to HTC Converter. Launch Pavtube DVD to HTC Converter for Mac, when it starts up, a dialogue box pops to ask whether you’d like to select Order or Trial. Click on “Trial” button. Insert your DVD to Mac or MacBook, click “DVD Folder” to load DVD movie from disc, folder and ISO image file, “IFO” to load DVD from ISO files. Preview the DVD as you like by clicking the “Preview” button. Step 2. Select movie chapters and specify audio tracks and subtitles for them. The titles in a DVD movie are all checked by default when you loaded them, if you just wanna rip and convert DVD movies to HTC with Main Title, you can right click on the main title to “Uncheck All” firstly, and then tick off the “Main Title” only. Click on the Audio box and select an audio track with desired language. Set subtitles in the same way. There’s also an “Only show force subtitle” option, which enables you to see subtitle only when actors are speaking a different language. For instance, if you specify English (your mother tongue) as your subtitle, and tick off “Force Subtitle” option, then when actors are speaking English, no subtitles will show up, but when they are talking with each other in French, the English subtitle will appear accompanying with the French. To convert DVD to HTC Droids, you need select the proper format specialized for HTC smart phones. Just click the drop down list of “Format”, and then tap on “Android” and choose an output format for your HTC Android. The Pavtube DVD to HTC Converter offers customized formats for HTC Android phones: HTC Droid Incredible MPEG-4 Video (*.mp4), HTC Supersonic Evo 4G MPEG-4 Video (*.mp4), HTC Hero MPEG-4 Video (*.mp4), HTC Legend MPEG-4 Video (*.mp4), and HTC Touch Pro MPEG-4 Video (*.mp4). These formats are specialized for both HTC Android phones, which guarantee fluent and perfect video playback. 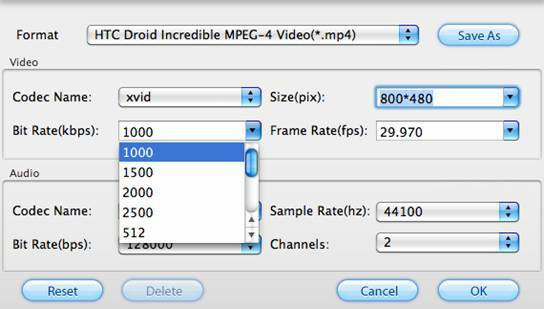 Step 4: Click "Convert" button to start converting DVD to HTC Droid videos on Mac. Now click "Convert" button and wait. The popup window will present you all the info such as conversion progress, conversion state, elapsed and estimated conversion time, and generated and estimated conversion file size. Once finished, you can get the output files via clicking on "Open" button effortlessly. 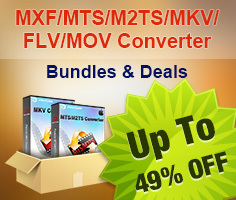 Tricks of using Pavtube DVD to HTC Converter for Mac. A. Let your Mac shut down automatically. You do not need to be there waiting all the time till it completes. The Mac DVD to HTC Converter allows you to set auto shutdown. You may set auto shut down before conversion starts by entering “Option” window and check the box of “Shut down the computer after conversion”. B. Cut down the file size (shorten converting time). Clicking on “Settings” and select a smaller video bit rate if you want to reduce the file size. It will still look fine on screen of HTC phones. Keep in mind that smaller bit rate value leads to a smaller output file size and lower video quality. To maintain better quality, just set video bit rate up. Transfer DVD movie to HTC Droid for playback. Finally, you got to transfer the converted DVD to HTC Droid. Details of transferring video to HTC Droid memory card (by the official site of HTC): To transfer files from your computer to your phone’s storage card, you need to set the phone’s storage card as a USB drive. Connect the phone to the computer using the USB cable, and then choose Disk drive from the on-screen menu that appears. The storage card is now mounted as a USB drive. Drag and drop the desired files to your PC to back them up. Then you can play them freely on HTC smart phone. Afterwards you can play the shows freely on HTC Droid. Wish the guide helps! How to play Videos, Music and Movies on your Galaxy S3?